Organising a Children's Day Games & Food Carnival at the Grace Haven Homespacer, off Yio Chu Kang Road, was what the Workers' Party did this year for Children's Day. It was a whole lot of experience for a lot of our members; not the visitation, not the organisation, not the preparation, but the chance and patience to communicate with these children. Gracehaven is a Salvation Army home for children who have social problems at school, home, etc...these children ranges from age 8-18. Hence, it was a group that we must approach with care and sensitivity. Everyone of our member played, had fun and enjoyed their time with these children. Somehow I managed to find the time to walk around, and I saw children talking to our members, some expressing their unhappiness and others were telling them about their school results. It was definitely an experience that money cannot buy. Team-building games, games stalls, art & craft counter, goodies bags, balloons, etc form the agenda for this carnival. Lunch was ready at about 12pm, with mouth-watering pizzas, sotong balls, fried fishballs, spring rolls and ice-cream as the menu for the day. Our members weathered the scorching sun which was easily a 33 degree celcius this morning. And as we were helping to clear things up for the closure for the day, boys about 12-18 years of age came forward to offer help. They helped to carry tables and chairs back to the respective rooms. Some helped to clear the rubbish. I looked on with awe as these children relished their sense of responsibilities. What made me smile even more reassuring was when I saw this boy, about 13 years old, he was going around the entire field in which we had team-building games earlier on. He was picking up litter from the field and carpark into a big, transparent plastic bag which he was holding onto in his right hand. I went forward and offered him an additional ice-cream apart from the one that he was entitled to. The smile he gave me told me that he was happy that people recognized his hard work. HAPPY CHILDREN'S DAY TO THE BIG CHILDREN OF THE WP! UN chief Ban Ki-moon has been informed that his special envoy Ibrahim Gambari will be welcome in Myanmar to discuss the current turmoil. I seriously hope that Gambari can solve the current situation. 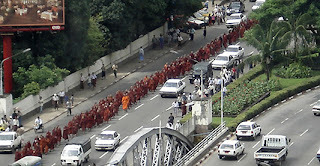 Its getting worse and these monks were just staging a peaceful protest! Security forces fired tear gas and warning shots from automatic weapons were used to disperse the crowds, which scurried for cover, leaving behind sandals in their haste and pools of blood where the faceoff turned violent. Different countries had been showing their support and had also disagreed with what the government of Myanmar is doing, that is to resort to using violence to stop this protest. China, Myanmar's traditional ally, issued a public admonition to the country's military regime to proceed with caution. 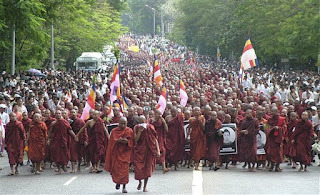 Toronto supporters congregated to lend their voice to the protests in Burma. More than 150 people gathered at Nathan Phillips Square last night to show support for demonstrators and Buddhist monks who have come under fire for their anti-government rallies. US President George W. Bush on Thursday said the world must press Myanmar's military rulers to end the violent crackdown and urged the junta to cooperate fully with UN envoy Gambari. "I call on all nations that have influence with the regime to join us in supporting the aspirations of the Burmese people and to tell the Burmese junta to cease using force on its own people, who are peacefully expressing their desire for change," he said in a statement. The US administration also ordered a freeze on the assets of Myanmar's military leader and 13 other senior officials. Let's pray that this 'peaceful' revolution will soon be over. Well, it definitely moved me as well. For those who believe in divinity, a quiet prayer would be the most appropriate thing to do now. At least four people including three Buddhist monks were killed Wednesday as Myanmar security forces used weapons and tear gas to crush protests that have erupted nationwide against the military junta. They said the monks were killed near Yangon's Shwedagon Pagoda, Myanmar's holiest site and a key rallying point for the clergy leading the protests now posing the biggest challenge to the junta in 20 years. September 25 this year is the 15th day of the 8th lunar month of the Chinese calendar. That is to say, on September 25, today, it's time to celebrate the Mid-Autumn Festival with delicious mooncakes! The holiday's history dates back to the Xia Dynasty (2070 BC–1600 BCE), when people would gather to celebrate the full moon in honour of the mythical moon goddess Chang'e. Nowadays, people celebrate by eating pomelos and sharing mooncakes with their friends and family. I came across the above gist of an article in 'Today' by Jasmine Yin and would like to share it with readers of my blog. The WP Youth Wing was invited to the Launch of NHG Diagnostics MOBILE X-Ray at Buangkok Green Medical Park yesterday. It was indeed an eye-opener for us. About 40-50 people turned up for the event with Mrs. Yu-Foo Yee Shoon as the Guest-of-Honour. Each invited organisation had between 2-3 representatives. The event started with a dance performance by the 'Ladies in Pink'. This is a group of breast cancer survivors. Great work! We also met up with the GM, Mr Tyrone Goh and Miss Jen Nee, Senior Executive from the Marketing Dept; the lady whom invited us. 3 fleets of condusive, fully furnished buses were filled with some latest medical gadgets to make healthcare screening more convenient. Screenings such as mammograms, x-rays, blood tests, etc can all be done at your door step. Hence saving the hassle of queueing at polyclinics and making one's way down to any GP or hospitals for check-ups. Besides tests, these buses also comes with friendly nurses to educate you on important health issues. It is kept clean at all time and its fully air-conditioned. Wheel-chaired bound residents can also get onto the buses without having to climb the stairs. I never know that the Buangkok Green Medical Park housed a few organisations besides the Institute of Mental Health. We also get to see the living conditions of these patients, only the exterior. Thick solid walls, with stainless steel grilled windows complete with decent doors. We walked pass the 'Woodbridge Hospital Heritage Corner', old gates and windows were displayed. Their living conditions are much better now as compared to the past. It was indeed a pleasure to be there yesterday. Lastly, I would like to once again thank Jen Nee and team for having us there. The WP Youth Wing had been invited to attend the launch of the NHG Diagnostics Mobile X-Ray yesterday at Buangkok Green Medical Park. SINGAPORE: Three mobile containers, owned by the National Healthcare Group (NHG), are providing blood pressure check, cholesterol and glucose level tests. The largest of the three is more than nine metres long, complete with a consultation room, a blood testing area and X-ray facilities. More services, such as pap smears and wireless transmission of digital X-ray images, will be available in the future. The NHG is now working with nursing homes, religious groups and grassroot organisations to make healthcare screening even more convenient. "We are now able to have a more comprehensive health screening closer to the community. Prior to this, only limited tests can be performed at community level. Services such as mammography, X-rays, and PAP smears are only available at the hospitals or clinics,” said Dr Tyrone Goh, general manager of NHG Diagnostics. SINGAPORE : Singapore's disabled athletes have scored a big win at an international sports meet in Taipei. The bi-annual event is known as the International Wheelchair & Amputee Sports Federation (IWAS) World Wheelchair and Amputee Games 2007. Singapore sent five athletes to take part in wheelchair racing and seven in swimming. . They joined over 1,000 disabled athletes from 43 countries. In total, Singapore's 12 athletes achieved 14 medals and 21 personal bests. All but one of the medals came from swimming events. The biggest haul came from 20-year-old Theresa Goh Rui Si. She collected 3 gold, 3 silver and 1 bronze. Theresa also attained two personal bests. Another golden girl is 15-year-old Yip Pin Xiu, who got four gold medals and attained three personal bests. 13-year-old Khristine Quek got 1 gold and 1 silver. Another swimmer, Joanne Liu Xin Yan, attained personal bests in all her events. As for male swimmers, Lieu Teck Hua will return with four personal bests. He also emerged fourth in the 100m Breaststroke event. James Leow Chen Hai scored two personal bests and emerged fourth in the 50m Freestyle event. Lim Keng Joo will also return with a personal best in the 100m Breaststroke. The swimmers will return on Wednesday at 6.45pm. In the 100m wheelchair race, Singapore's Eric Ting Chee Keong came in second and recorded his personal and seasonal best. In a separate 100m wheelchair race, 19-year-old Firdaus Nordin came in fourth place. He was just 0.03 seconds short of a third place win. He also took the fourth spot in both the 200m and 400m races. Other wheelchair racers Norsilawati Mohd Sa'at and Dr William Tan also attained personal bests in all their events. I happened to come across this banner in Hougang that says 'Eric Low's Dialogue Session'... and hence I decided to go and listen for myself. He has been out of action for quite some time. The room which can fill about 30 pax looked quite full with a lot of them looking like PCF teachers and some members from RC too. Well, don't ask me how I know, their dressing and conversation tells me so. Therefore, probably only about 10-15 people are genuine residents of Hougang. My friend who was seated near to the aisle, looked at his watch and commented that...its 8.20 already and the session has not started. By the way, it was suppose to start at 8pm. I happened to notice the lady next to him, she overheard that and was like looking out for the right opportunity to walk to the back to inform Mr. Eric Low. Hmm.... so this one has to be RC member too. True enough, when I looked away, she stood up, walked to the back and seconds later Eric Low started the session. He addressed the crowd in 3 different languages; Mandarin, Malay and English. He spoke fluent Engli sh and Malay. As for Mandarin it was pretty bad. In his addressing speech, he mentioned that the purpose of this session was due to overwhelming response from residents who wanted to see him but could not find him because he had stopped operating his MPS session since GE 2006. With that, he said that since he is not appointed MP for Hougang, he is not obligated to hold any MPS session. However, he did give credit to Mr. Low Thia Khiang (MP for Hougang SMC) for holding his weekly MPS session. Eric Low also pointed out that its not his own intention to run in Hougang, its the political party which he belongs to, PAP, that makes the decision. Then as if he realised that he made a mistake, he quickly followed by saying...he loves Hougang residents and had some plans install for them. He emphasizes a lot on how much he had done, and how many residents had benefited from his proposal. This addressing speech ended at about 8.50pm (the banner says that the dialogue session is from 8-9pm) This makes me wonder.... so that's it? The residents are here to listen to addressing speeches? Just before 9pm, Mrs Lim Hwee Hua, Minister of State, came. She was invited by Eric Lo w to share on the recent spate of events on the CPF changes, housing, employment, etc. Eric Low pointed out that since he is not appointed MP hence a lot of things he is not involved and is not aware of and so is not the best person to address the residents' concern and therefore he had invited Mrs Lim. She touched on these sensitive issues in one language, English. She took about another 15 mins or so to explain. Next it was Q & A session. Hmm...only two fellow stood up and ask questions irrelevant to the topic covered by Mrs. Lim. Eric Low then told them that these are personal problems and he will see to them personally after the session. I am reading a book on body language by Allan Pease and I decided to practise it on the spot. During Mrs. Lim's explaination, I kept looking at Eric Low, observing his body language. Tight lips which means that he is keeping a secret, slouching on his chair reflected his attitude and he was yawning, not once but multiple times. At times, he rested his chin on his left hand and he seemed to be looking into space.... as per what I can see, I could be wrong. On the other hand, Mrs. Lim Hwee Hua portrayed a very right attitude with good sitting posture and confident look. The whole session ended at about 9.30pm with loads of refreshments being served to us. Hmm... so Mr. Eric Low did just the addressing speech. This was featured in Weekend Today on 15th September 2007. It briefly touched on the 3 key men who kept the WP going till today. The WP is turning 50 on November 2007, and a dinner function will be held on 3rd November at the Fortunate restaurant. I have to say that this book and the names mentioned in this book were all pretty alien to me except for Lee Kuan Yew. Since young, our academic history books were all about merger, separation and Lee Kuan Yew. From young, we were taught and probably made to think that Lee Kuan Yew was the founding father of modern Singapore, our saviour, its all thanks to him that Singapore is what she is today. What happened to people like Goh Keng Swee, Toh Chin Chye, and S. Rajaretnam? These people contributed so much and yet little was mentioned in any academic books. Both Toh and Goh, were major and critical contributor of Singapore's economy stability. S. Rajaretnam, until his demise recently, then most people realised that he was the man who wrote our pledge. And lastly, of course, Lim Chin Siong. The man who co-founded PAP together with Lee Kuan Yew. The man who made such a great impact to many Singaporean workers, the man whom citizens and friends respected and admired. This man, was left out from our books as far as I can remember. I read from somewhere that the recently released Ministry of Education History books of Singapore school textbook for 2007 onwards will feature Lim Chin Siong in one whole page. This is indeed a milestone for our Nation history as this is the first time. Little was mentioned about him in Lee Kuan Yew's Memoirs too. I was reading this book at home and was telling my younger sister about this man, etc... She who also got interested, picked it up to read too. One of our WP comrades, who was classmates with Lim's son, did not know that his father was once a 'somebody' in Singapore's history until Lim's death in 1996 whereby he saw many ministers who came forward to pay their last respect. My neighbour who was in her early 80's remembered Lim vividly. When I showed her the book, she immediately recognises him as Lim Chin Siong. She was telling me about the crowd that turned up at his rally, how hundreds and thousands of people waited along the road for his release from the prison. Lim Chin Siong would have been our Prime Minister if not for Lee Kuan Yew, I should say. However, if Lim were to become our PM instead of Lee, what will Singapore be? Is it going to be better or worse? Are we going to be more democratic as what we were deemed to be. However, I do believe that Lim was not a communist, gut-feeling tells me so :) Women always has a better 6th sense. He was labelled as one, for one's own selfish political agenda. Lastly, I would very much love to be able to see Lim's speeches back in those days. If only, we can still find them.
" A Merdeka rally was organised to press for more freedom. It was held at the old Kallang Airport, at the site of the present headquarters of the Peoples Association. Halfway through the rally, the stage collapsed, causing panic and confusion as the crowds surged forward, screaming and shouting. It was near panic. Suddenly, I saw a slim figure climbing up on a van, carrying a microphone and commanding the crowd to sit still. Order prevailed, the crowd sat down, and a disaster was averted. The young man who controlled the crowd was Lim Chim Siong; it was an impressive performance." " I was the first person to rush to his house when I heard that he had suffered a heart attack which ended his life. He was 63, and still quite young. He was a loyal friend to many people. That was why when he passed away, there was such an outpouring of grief, eventhough he had left the political scene for so long. Even his former political opponents came to his wake, including S. Rajaretnam and several former cabinet ministers. He was a rare political phenomenon, selfless and dedicated, not for his personal advancement, but for the general good. He will long be remembered as a staunch anti-colonial fighter." A. Mahadeva was a former journalist with the Singapore Standard and the Straits Times during the 1950s and 1960s. "That was Lim Chin Siong, symbol of a genuine left-wing democratic movement and a household name in Singapore politics during the 1950s and the early 1960s. That was Lim Chin Siong whom the British colonalists had their local lackeys destroyed in order to protect their own economic and political interests, and to maintain their neo-colonialist hold on the island as the bastion of their hegemony in the region. That was Lim Chin Siong whom they had destroyed using the smears of communism and Chinese chauvinism as their chosen weapons. They branded him a communist and linked him to the MCP's armed struggle. Yet, he participated in legal political activists, even contesting and winning elections to become a member of the colonial legislative assembly. They ganged-up with the reactionary forces in the region to destroy Lim Chin Siong and the entire left-wing democratic movement in Singapore with the infamous Operation Cold Store launched on the 2nd opposition in Singapore. They lied about Lim Chin Siong. They smeared his good name and hence, the good name of his family. They misrepresented Lim Chin Siong's political thinking and objectives. They envied, but also feared Lim Chin Siong's popularoty as a genuine left-wing political leader. Finally, they cruelly destroyed Lim Chin Siong's political life through deceit, deception and conspiracy." Said Zahari was a one time editor-in-chief of the Malay-language newspaper Utusan Melayu and an advocate of unbiased press freedom. Although he currently reside in Malaysia with his family, he has insisted on retaining his Singapore citizenship. Together with Chin Siong, he was arrested during Operation Coldstore, a joint Malaysian and Singaporean operation to silence 117 opposition and union. 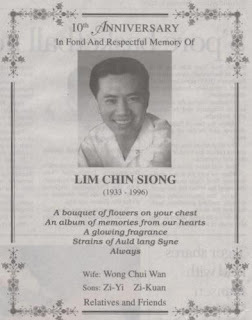 "On the evening of 5 February this year (1996), a most humane and valiant heart stopped beating - Chin Siong left this mortal world!" "To this day, many workers of his generation still fondly remember Chin Siong for what he had done for the workers in the 1950s and 1960s. But it was as a political leader that Chin Siong will be best remembered and respected." "He strongly opposed the terms of Singapore's merger into Malaysia because he was totally convinced that the unequal terms of merger for Singapore would lead to racial disharmony and division among our people. 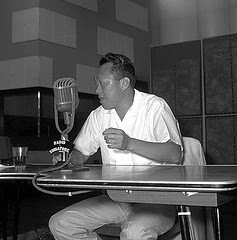 The outbreak of racial riots after the merger in 1963 and the subsequent expulsion of Singapore from Malaysia amply exonerated Chin Siong's stand." "But to be proven right was insufficient to earn Chin Siong's release from imprisonment. His continued incarceration took a severe toll on his health, and in 1967, he became seriously ill. It was during the acute stage of his illness that Chin Siong was exiled from Singapore and denied his rightful role in the political life of our country." 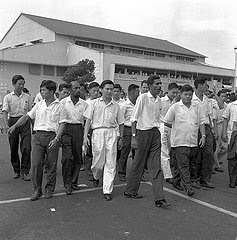 Both Chin Siong and Hock Siew were leading members of the Barisan Socialis when they were arrested and detained without trial together with well over a hundred of others in early February 1963. Chin Siong's cremation was attended by about two thousand mourners on the morning of Friday, 9 February 1996. The cremation hall was jam-packed with people and many had to stand at the entrance foyer and on the grounds around the building. Some of those attending had flown in from as far as Penang. Several others had come from KL. Hock Siew ended his oration with a call for an ovation of clapping to bid Chin Siong a hero's farewell. The response was thunderous as the prolonged clapping rose to a crescendo with the moving of Chin Siong's body away from the cremation hall to the incineration chamber. "Lim Chin Siong would have adapted, and would have approved. He flashed brilliantly across the Singapore sky like a meteor, bringing hope and excitement to the people coming out of the intellectual darkness of the colonial era. He brunt out before our eyes. His passage from student activist, to workers' leader, to charismatic freedom fighter, and the years of his young life spent in political prisons, is the stuff of revolutionary legend. Singapore's history begins when he is given his proper place in its annals." "....the youthful Lim rose to prominence primarily through his own political genius. This is what really caused the British authorities to consider his a threat. He was barely 20 years of age when his political activity caught the eye of British colonial authorities." "Perhaps because of his ability with the local vernacular or his capacity to organise and inspire Singaporean workers, he was described as the most politically talented on the scene at that time. In addition, he was described as 'handsome' and special note was made of his age as 'ten years younger then Lee Kuan Yew'...."
"By chance, it was the time of the national election results in Singapore, and the party in which Lim and Lee had initially worked together but which became Lee Kuan Yew's political juggernaut, the People's Action Party (PAP), had won all seats but four. In response to a radio announcement that there would be an investigation into how even these four were lost, Lim Chin Siong shook his head in quiet disbelief." "Lim Chin Siong always denied claims that he was associated with the communist party, and he accused Lee Kuan Yew, who hounded him with this accusation, of using 'the whole machinery and facilities of the state...to muzzle his political opponents'." "Goode commented that most of the detainees released before the PAP took office were brought into the government, but 'only a few are regarded as dangerous. Of these Lim Chin Siong is by far the most capable.....The Prime Minister (Lee Kuan Yew) has spoken of the need to take the initiative against Lim Chin Siong before his position becomes too strong'." "In the Outlook for Singapore report, it was reported: Lee is 36 and the average age of his Cabinet is 38. His most dangerous opponent Lim Chin Siong (aged 26) whose release from detention on 4th June was timed by Lee to exclude him from office, both in the Government and in the newly elected Party executive committee. These two leaders symbolise the struggle between non-Communists and the Communists to win the loyalty of the Chinese-speaking mass of the population, which tends towards Chinese Chauvinism and sympathy with Communism." Above are abstracts from the book 'Comet in our sky', for the full story, get the book and find out for yourself. Greg Poulgrain is a Lecturer in History in Griffiths University in Brisbane, Queensland. He has been working on SOutheast Asian history for over two decades. "He soon found school life there restrictive and persuaded his father to use his influence to transfer him to the Chinese High School, then, as now, the premier Chinese medium high school in Singapore. He was now sixteen years old, and like many young men of his generation, much more mature than his years. Here, he would meet and interact with well-read, knowledgeable, confident, assertive students, many of whom had been radicalised by the war years, so different from the laid-back country bumpkins he knew back in Pontian." "Lim Chin Siong would soon make his mark as an active student leader, espouse radical causes, and become firm friends with Fong Swee Suan, his classmate in Chinese High School." "In 1953, when he was barely 20 years old, he joined the Changi Branch of the Bus Workers and correspondence. Soon, he became a well-known figure in the trade unions, with a flair for public speaking and a strong sense of commitment to the cause of labour." "He was elected Secretary of a small union bearing the grandiose name of the Singapore Factory and Shop Workers Union (SFSWU) with a membership of barely 300 members. There is some ambiguity as to whether he founded the union, although Chin Siong would later say that he joined an existing union and was elected secretary. But there was no doubt that within a brief period of just a year, the membership of SFSWU had expanded rapidly to more than 30, 000, making it one of the most powerful trade unions in Singapore at that time." "Chin Siong would be prominent enough to attract the attention of Lee Kuan Yew and his colleagues when they were looking around for grassroots leaders to form a new political party." "The newly established PAP decided to contest the elections on 2 April 1955 in four constituencies 'to expose the inadequacies of the Constitution and to secure a forum to propagate its objectives'." "James Puthucheary, who was in charge of PAP publicity for the elections, recalled the first rally held in a remote Chinese village. 'Toh Chin Chye spoke first, in English! No response from the crowd. Ong Eng Guan was next, in Hokkien, but not very good. The crowd was restless. Then, Lim Chin Siong stood up. He was brillaint, and the crowd was spell-bound'........."
"Arthur S.W.Lim, the well-known eye surgeon, recounted another experience of the youthful charisma and the powerful impact of Chin Siong's oratory of the period. 'There were 40, 000 people, each mesmerised by Lim Chin Siong's oratory. "The British say you cannot stand on your own two feet", he jeered, "Show them how you can stand!" And 40, 000 people leapt up - shining with sweat, fists in the air - shouting, Merdeka'..."
"Chin Siong was elected to his seat in the Bukit Timah constituency and entered the Legislative Assembly at the youthful age of 22." 'Chin Siong was introduced to me by Lee Kuan Yew. Kuan Yew came to visit me in my little office underneath the stairs, one desk, and one naked light. And he said, "Meet the future Prime Minister of Singapore". I looked at Lim Chin Siong and laughed. He said, "Don't laugh! He's the finest Chinese orator in Singapore and he will be our next Prime MInister of Singapore.'...." 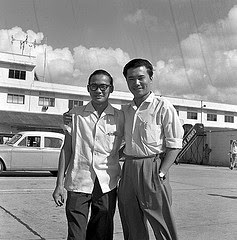 ".....on 8 July 1956, Lim Chin Siong was elected to the Central Executive Committee (CEC) of the PAP as Assistant Secretary General with the largest number of votes, ahead of Lee Kuan Yew and Toh Chin Chye." "The October repression effectively excluded Lim Chin Siong from participation in the PAP deliberations regarding the new round of consitutional talks in London to be led by Lim Yew Hock. Only Lee Kuan Yew would represent the PAP. Chin Siong's absence from the talks would conveniently remove the thorny British problem........"
"The October repression therefore cleared the stage, leaving the two principal beneficiaries, Lim Yew Hock and Lee Kuan Yew, to determine the shape of the next phase of Singapore's constitutional advance." 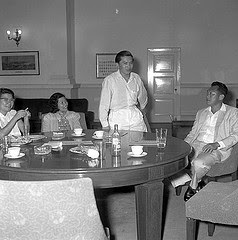 "Lee Kuan Yew played the perfect foil, with his incisive parliamentary thrusts, which the Chief Minister and his cohort of ministers failed miserably to meet.......The popularity of Lim Yew Hock sank with each new repression or scandal, just as Lee Kuan Yew's star continued to rise with each successive parliamentary debate." "Thus, the true beneficiary of the repression launched by Lim Yew Hock government was Lee Kuan Yew." Tan Jing Quee is a lawyer with a strong interest in the post-war political history of Singapore and Malaysia. 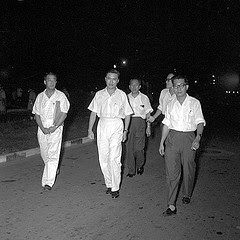 He was detained in October 1963 after Operation Coldstore and the PAP's electoral victory. After his release, he went to study law in London where he spent considerable time with Lim Chin Siong after the latter's release. He was detained again in 1977 for a briefer period. 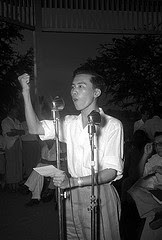 "On his election to the Legislative Assembly in 1955, and in the aftermath of the Hock Lee riots, Lim addressed the charge directly. 'Sir, I would like to say that I am an elected representative of the people. As such, I am not answerable for my actions to the colonial official, I am only answerable to the people. Secondly, as a member of the PAP, I stand for a free democratic Malaya through peaceful and non-violent method....'...."
"Lim maintained this position throughout this period. On breaking with the PAP in 1961, he reiterated 'Let me make it clear once and for all that I am not a Communist or a Communist front-man or, for that matter, anybody's front-man'....."
"Whether a person is a Communist or a Communist agent, only he knows and God knows. Between his conscience and God of course lies the Special Branch and it is up to them to show that these men whom they have arrested are Communists or Communist agents." The people ask for fundamental democratic rights, they have only got the freedom of firecrackers after seven o'clock in the evening. The people ask for bread and they have been given stones instead..."
T.N Harper is a fellow of Magdalene College and Lecturer in the Faculty of History, University of Cambridge. His principal interests are in South east Asian history and the history of the British Empire. "This volume then is a modest attempt to try to set the record straight on the legacy of a remarkable and charismatic leader who represented the principal alternative in the late fifties and early sixties, and would haveled Singapore differently, if not for his tragic fate." 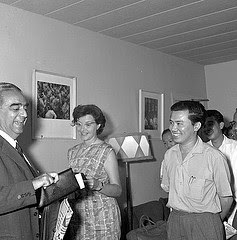 ".....Lim was undoubtedly the prime mover of the island's predominantly Chinese working class population." 1951 - Detained for questioning in Aug & Oct in connection with examinations boycott; subsequently expelled from school. Worked as part-time teacher and attended English evening classes. 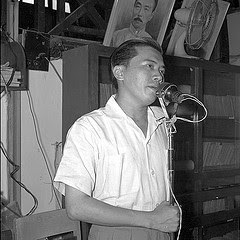 Lim Chin Siong, 林清祥 (28 Feb 1933 - 5 Feb 1996) was an influential left-wing politician and trade union leader in Singapore in the 1950s and 1960s. Born in Telok Ayer Street, Lim studied first in JB, before entering Singapore's Catholic High School and The Chinese High School in 1949 and 1950 respectively. He was later expelled from school for engaging in activities in the Anti-British League. 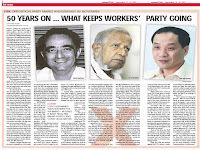 Lim’s influence in politics stemmed from his union work as a paid organiser of the Singapore Bus Workers Union and the Singapore Factory and Shop Workers Union. With his strength in Chinese oratory which was a critical factor for tapping the support of the Chinese-speaking masses, he was recruited into the PAP by Lee Kuan Yew. 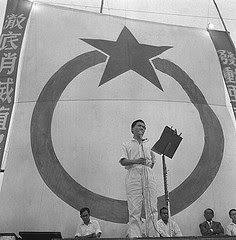 Having joined the PAP in 1954, Lim's popularity raised rapidly and he became the leader of Chinese workers, trade unions and Chinese middle school students in the 1950s. He was slim, youthful, dedicated, and had a handsome boyish face. Being able to speak fluently in Hokkien among the chinese was legendary. At a very young age of 22, he was elected into the legislative assembly in 1955 and together with LKY, represented the PAP in 1956 in London for the Constitutional talks. I came across this book on the Internet and was very interested to land my hands on it. I practically searched the entire Singapore book stores for it but to no avail. Fortunately, one of my WP comrades has it. And I wonder, what happen? Why did our PM became LKY? I had finished reading it and phew!!!! What a man Lim Chin Siong was!!! I will be extracting quotes from the book on this man who was nearly our PM. Click on the links below and read them! 1) What were the offence both had committed? 2) Which one is considered more of a criminal offence? 3) Who is owing the Government more money? 4) Both Dr Chee and Durai, who should deserve the right to leave the country? 5) Who has got a more valid reason to leave the country? Dr Chee needs to visit ailing father-in-law or Durai who needs to work in another country? 6) So Durai was allowed to leave just because he is working in another country to pay off his remaining debts? SINGAPORE: Opposition politician Chee Soon Juan will be jailed after refusing to pay a fine slapped on him for violating the Bankruptcy Act. He was fined S$4,000 in February for trying to leave the country without the permission of the official assignee. He then filed for an appeal against the court's decision. 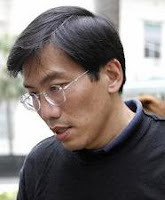 When the case was heard on Tuesday, Chee's lawyer argued that a "benefit of doubt" should be applied to his client. He said Chee did apply for a permit online, but no clear instruction about not being able to travel was given until after the date he was scheduled to leave Singapore. The High Court judge, Justice Choo Han Teck, dismissed the appeal. As Chee did not pay his fine by the 5pm deadline on Tuesday, he will be jailed for three weeks. He will serve his term at the Queenstown Remand Prison. I had abstracted Dr Chee's list of rejected application from the SDP website, I was surprised by the many many rejections he had gotten and one of which was even to visit his ailing father-in-law! SINGAPORE: The chief executive of Singapore investment company Temasek Holdings, Ho Ching, is the third most powerful woman in the world. This is according to Forbes magazine, which has ranked German Chancellor Angela Merkel at the top and Chinese Vice-Premier Wu Yi second. Forbes says Ms Ho is, increasingly, a "force to be reckoned with, as her deal-making ambitions span the globe". She has been credited with "converting Temasek from a Singapore-focused firm to a leading investor in Asia". Temasek's investment portfolio grew 27 percent last year to US$108 billion – the first time it has crossed the US$100 billion mark. This is Forbes' fourth list of the "100 Most Powerful Women", which ranks them based on a combination of economic impact, media reach, and influence. Ms Merkel, Germany's first female chancellor, heads the list for the second consecutive year. But this year's list shows a significant increase of female power in the Middle East and Asia. Media heavyweights, such as Oprah Winfrey, also have a significant presence this year. To view the complete list of the 100 Most powerful woman in pictures click here.